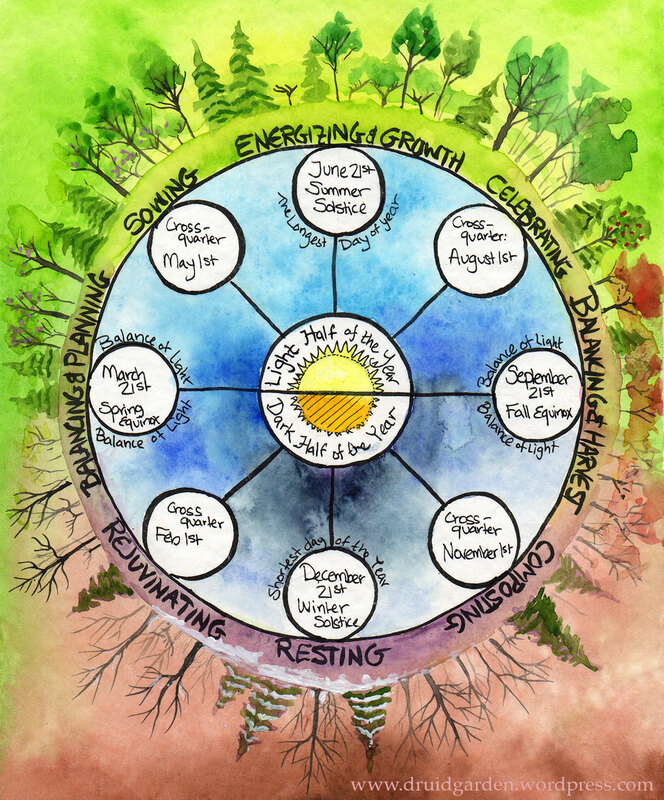 Enjoy this informative and timely post about nature’s cycles and how to tap into our inner rhythms. You are welcome. Great article! I loved this posting. The Wheel of the Sun graphic depicting the seasons is one of the best I have seen. Is there a version of this particular graphic for the Southern Hemisphere? I would love to print it out and put it on my young daughter’s bedroom wall. Thanks again for your great writing. John, it wouldn’t be too hard. I’m out of town now but will try to get to it when I return! Thanks Willowcrow. I am aware you are pretty busy, but if you get the time I would be very appreciative. I made the graphic–but its backwards, lol. it goes counter clockwise now. Is that ok? Yes that is fine Willowcrow. I deeply appreciate that you have taken the time to do it. Thank you! Nice piece on this classic topic. Really interesting post, and it totally reflects how I feel at different times of the year. One minor quibble, if I may: you write that the sun is masculine and the moon is feminine. In some pagan cultures, including the Norse (who living where it was dark for months at a time were very aware of the power of the sun), the roles are reversed and the sun is a goddess, Sunna, while the moon is a god, Mani. Just another way of looking at things, I guess! Thanks for your comment! In terms of the sun and moon, that’s how they are viewed in the Druid revival tradition. But I can totally see how they could be reversed given the Norse context. Thanks for the clarification. It just goes to show, I think, that our concepts of gender identity and gender roles are totally culturally mediated. In my own practice, I tend to shy away from assigning gender to natural phenomena but it is interesting to see how different pagan traditions have done so in different ways. Anyway, I didn’t mean to derail the conversation: the point of your post, and the effect of the seasons, is something which I totally agree with and think needs to be given more recognition in our lives today. I think its a great point, and I appreciate your feedback :). Sometimes we get so much in the vein of our own traditions that we fail to see outside! Great post! I love living with the seasons. With each passing year, though I resist winter, i do enjoy the hibernating aspect. And I really do love the beauty of the snow and the black and whiteness of everything. For today, though, I am enjoying autumn, and hoping it lasts a long time before the coming of winter. I have really grown to love winter. Winter = rest, reflection, writing, and studying…and I appreciate all of that rest after a busy season :). Reblogged this on Inspired HeArt. Thank you for the reblog, Astrolenn! Great post! In the Creation Spirituality writings of Christian mystic Matthew Fox, he speaks of the same cycles and lists four that reflect the wheel of the year. Via Negativa, Via Positiva, Vis Creativa, and Via Transformativa. If more of us would be in tune with these cycles our world would be a happier and healthier place. Blessed be! Thank you, David! And thank you for the info on Matthew Fox! I really like your perspective on this. Thank you very much for posting it! What a nice post. I feel so balanced just having read it. I love the idea of cross-quarters. They sort of break it up in a nice way – get us thinking ahead in a way, or reminding us to get ready. Thank you Willowcrow.